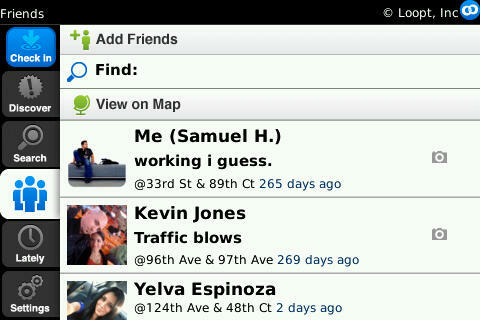 Visual Tour of new BlackBerry Loopt App, Version 2.0. 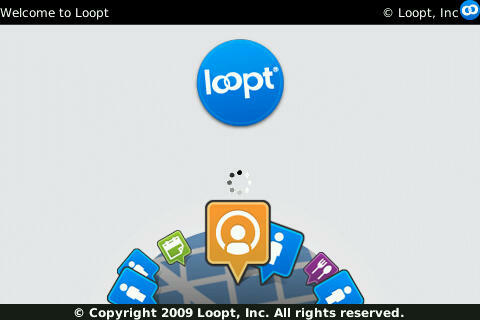 Loopt Version 2.0 was released for the BlackBerry a couple of days ago on BlackBerry AppWorld so I decided to take a quick spin with it. I have tried the previous version 1.0 and didn’t really find it very useful at all especially since it was lacking many functions that were in the iPhone version. Is version 2.0 a massive improvement over the original? Yes, it is. This is the initial load screen when starting the app. It is very clean looking and loads very quickly. 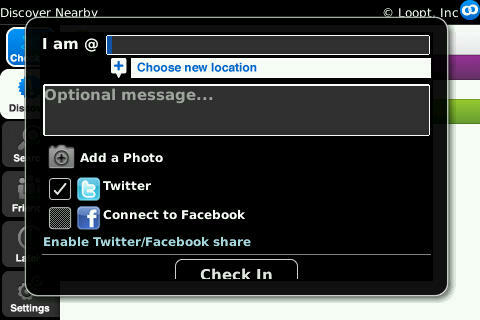 You only see this screen for maybe about 5 seconds (BlackBerry Bold 9000). Upon loading, you come to this screen. The layout definitely is a lot better looking then the previous version which was also very hard to navigate. This version is very easy to use and everything is separated by a tabbed interface. Above is the “Discover” tab. This tab basically shows you all the “Hot Place”s and “Hot Events” in your area. This option is very similar to other apps like Buzzed and Where. If you click on the button that says “View on Map,” Loopt brings up a map with your location and all the items available around you that you can check out. Very handy. I wonder if they are sourcing their maps from BlackBerry Maps, Google Maps, or their own mapping service. Their website uses Google Maps, so I’m assuming their app somehow ties into to the Google Maps app. The next tab down is the “Search” tab. 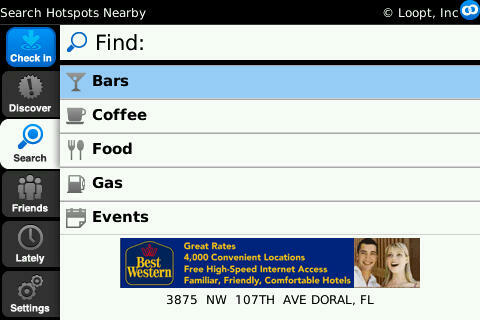 From here, you can search for categories like bars, coffee, food, gas, and events.Also notice the advertisement. Each tab has an ad that is location based. 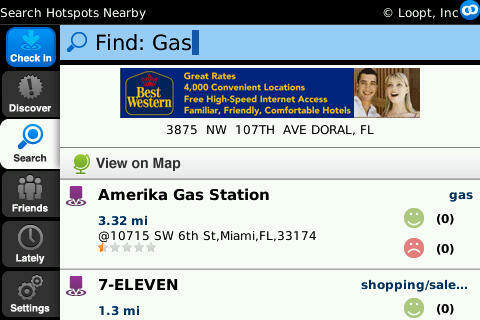 By clicking on the “Gas” category, Loopt brought up a list of all gas stations near my location. 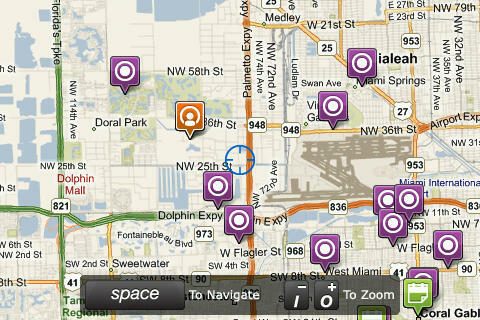 You can also “View on map” like in the previous “Discover” tab. As you can see, there is another ad. This is the “Friends” tab. Self explanatory. Shows all your friends who are on your list. Again, you can view everyone on your map. From here, you can also add friends which brings up the next screen. From this screen, you can add friends based on their mobile number or from your contacts list. A new item on here is the “Friends you may know” section. This seems to list people who are either near you, friends with some of your contacts, or some other unknown way. Clicking “Friends you many know” brings up the below screen. From here, you just ad people you might know. I believe they have to approve you however if you do decide to ad them. This is the “Lately” tab. It shows a timeline of recently occurring items. Not much else here. This is the “Check In” button. From here is where you would do all your updates. You can add your location to each update if you choose as well as any other optional messages. 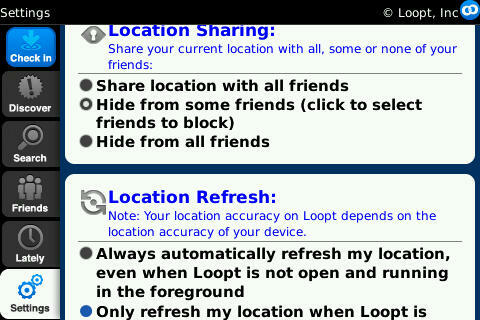 Loopt also offers you the option of updating your Twitter of Facebook status with your Loopt updates. Loopt really made a serious effort on version 2.0 to update an app that wasn’t really that great. This new version is much nicer looking, much easier to use, and much more useful. Hopefully this update will get more people into using the Loopt service especially since you can get it to update Twitter and Facebook statuses with location. I do recommend to check it out if you haven’t already. « New Cheaper Xbox 360 DVD Game Cases? I Hope Not.